Last week, President Donald Trump was quick to get to work in his first week on the job, and implemented a wide-range of policies that would directly impact Canada. The Trump Administration indicated that President Trump was looking forward to move quickly on renegotiating the North American Free Trade Agreement. President Trump indicated that he was looking forward to meeting Prime Minister Trudeau. According to a spokesman for the President, “Canada has a very special status” to Donald Trump and Canada would not be a target when NAFTA renegotiations begin. President Trump pulled out of the Trans-Pacific Partnership – a move almost certain to kill the 11 country trade deal which the Canadian government was very in favour of. President Trump signed executive actions to move forward on the construction of the Keystone XL and Dakota oil pipelines. This move should help the Canadian economy and bring much needed jobs to the province of Alberta. 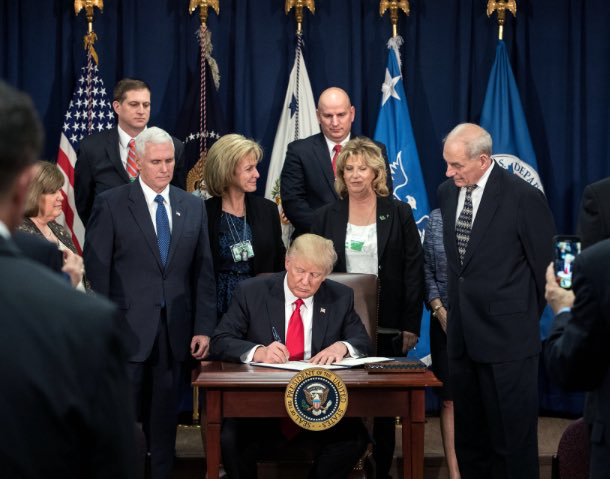 The President’s executive order, “Protecting the Nation from Foreign Terrorist Entry in the United States”, faced a lot of criticism and reactions. However, there is a lot of information in the President’s EO. True North’s Senior Fellow, Candice Malcolm, was able to analyze the EO and highlight both the positive and negative aspects.